We’re still a long way out on that Chris Pratt-starring Knight Rider reboot—if it even happens that way now that he’s in the process of becoming a huge movie star and with what are sure to be extensive Marvel commitments—but the staple of 1980s television is never too far from our hearts and minds. And in that spirit, we’ve got a reunion of sorts on our hands, as stars David Hasselhoff and KITT get back together for this commercial, and it feels so right. Hasselhoff’s slide into wing-nut lunacy has been well documented by the paparazzi, reality TV, and even his own videos that show his occasionally questionable eating habits, but it’s been a while since we caught up the Knight Industries Two-Thousand, better known as KITT. And apparently over the years, he’s become a wee bit kooky in his own right. If this video, a commercial for Samsung’s new “Smart Home,” is to be believed, he’s gone down a jealous, jealous path, one that apparently places him squarely in stalker territory if you ask me. I like the growing consensus of artists who are saying, “Anything you can do, I can do better. And with Legos.” In the next 10 years, I see an influx of Lego builders who will recreate everything the world has ever seen, using solely the multi-colored building blocks. And only then will we find out where Jimmy Hoffa is buried. 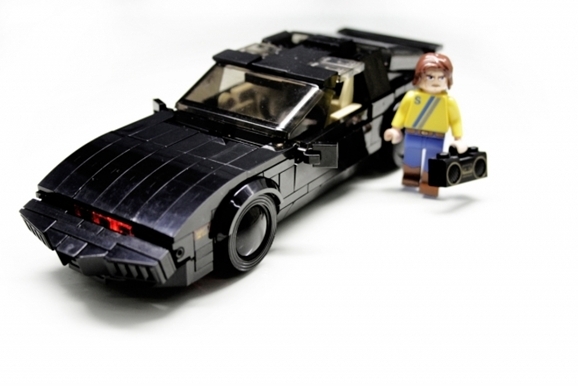 “You can play with me, Michael, but I am not a toy.” That’s a made-up line of dialogue I just gave to this snazzy Lego rendition of that most badass of talking vehicles, KITT from the TV show Knight Rider. (Sorry, Speed Buggy.) We just recently oohed and ahhed over Lego architecture artist Orion Pax — real name: Alex Jones — who recreated the Ghostbusters firehouse and the Ninja Turtles Party Wagon, and even though KITT isn’t boasting the same amount of insane detail, it’s still a project worthy of more than a few impressed stares.